Rapid human population growth and habitat modification in the western United States has led to the formation of urban and exurban rangelands. Many of these rangelands are also home to populations of black-tailed prairie dogs (Cynomys ludovicianus). Our study aimed to compare the vegetation composition of an urban and exurban rangeland, and explore the role that prairie dogs play in these systems. The percent absolute canopy cover of graminoids (grasses and grass-likes), forbs, shrubs, litter, and bare ground were estimated at sampling areas located on and off prairie dog colonies at an urban and an exurban site. Herbaceous forage quality and quantity were determined on plant material collected from exclosure cages located on the colony during the entire growing season, while a relative estimate of prairie dog density was calculated using maximum counts. The exurban site had more litter and plant cover and less bare ground than the urban site. Graminoids were the dominant vegetation at the exurban plots. In contrast, mostly introduced forbs were found on the urban prairie dog colony. However, the forage quality and quantity tests demonstrated no difference between the two colonies. The relative prairie dog density was greater at the urban colony, which has the potential to drive greater vegetation utilization and reduced cover. Exurban rangeland showed lower levels of impact and retained all of the plant functional groups both on- and off-colony. These results suggest that activities of prairie dogs might further exacerbate the impacts of humans in fragmented urban rangeland habitats. Greater understanding of the drivers of these impacts and the spatial scales at which they occur are likely to prove valuable in the management and conservation of rangelands in and around urban areas. GUNNISON, Colo. – Work to protect the Gunnison’s prairie dog by Colorado Parks and Wildlife has proven successful during the last four years and biologists are continuing with more research to improve methods to sustain populations. “In some situations prairie dogs can be seen as pests, but they are critical in the environment and help to promote survival of numerous other species such as burrowing owls, badgers and raptors,” said Dan Tripp, a wildlife disease researcher with Colorado Parks and Wildlife. In Colorado there are three species of prairie dogs. The Gunnison’s prairie dog resides primarily in the southwest portion of the state. The others are the white-tailed prairie dog which lives mainly in northwestern Colorado, and the black-tailed prairie dog which inhabits areas along the Front Range and eastern plains. Plague, caused by a non-native bacteria carried by fleas, has been identified as a threat to the stability of Gunnison’s prairie dog populations in Colorado. Outbreaks of plague frequently kill every prairie dog in a colony. To combat the disease, agency biologists are dusting prairie dog burrows with an insecticide powder that kills fleas. Researchers are also evaluating the efficacy of oral vaccine baits which may prevent plague in the animals. The bacteria that causes plague was transported to North America around 1900 and was subsequently found in Colorado around 1940. Because prairie dogs did not evolve with the bacteria, they carry little immunity to fight off the disease. Controlling plague in prairie dogs may also help limit potential exposure to people and their pets. In 2010, CPW biologists started dusting some burrows in the Gunnison Basin with an insecticide that kills fleas. The experiment has worked. In some cases, nearby colonies that were not dusted were wiped out by plague while colonies that were dusted remain healthy. Biologists also said that they’re seeing many more prairie dogs in more areas in the basin this year compared to five years ago. Although the insecticide is not harmful to other species, applying it is labor intensive and expensive. For dusting to be effective every burrow in a colony must receive an application annually. A potentially promising treatment is the oral sylvatic plague vaccine, Tripp said. Developed by the U.S. Geological Survey’s National Wildlife Health Center, the vaccine—still in the experimental stage—works well in the laboratory. It is administered in a cube flavored with peanut butter. The baits also contain a red dye that adheres to animals’ coats which helps researchers track the prairie dogs that eat the bait. This is only the second year that the vaccine has been tested in the field in Colorado. Longer term monitoring will be needed to determine its efficacy. “So far, we’re encouraged by the results and we are optimistic that the vaccine will be effective in limiting future plague outbreaks,” Tripp said. In the Gunnison area, four prairie dog colonies are being used for vaccine testing. Two colonies are receiving the vaccine bait, two are receiving no treatment. In Teller County the test is being conducted with two colonies. The vaccine is also being tested in Arizona, Montana, South Dakota, Texas, Utah, and Wyoming. The experiment will continue for another two years and is a collaborative effort among more than 30 federal, state and tribal agencies and nongovernmental organizations. In Colorado, the vaccine research in Gunnison’s prairie dogs is occurring on public land—state wildlife areas, BLM and National Park Service property. 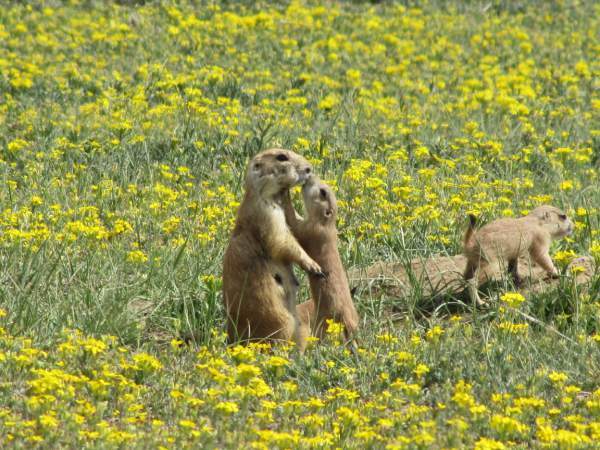 Contrary to public perception, prairie dogs don’t reproduce prolifically. Females have only one litter of 3-5 pups each year and the natural mortality rate of the young is about 50 percent. Consequently, the colonies generally do not spread rapidly over wide areas. Tripp explained that few connections between colonies across a landscape exist; so when a colony is wiped out it may have little chance of being re-colonized. “By preventing plague we can have healthy, stable prairie dog colonies that we can manage on public lands,” Tripp said. The conservation work is aimed at preserving the ecological niche of prairie dogs and preventing a listing of the Gunnison’s prairie dog under the federal Endangered Species Act. If the animal is listed it could lead to various land-use restrictions. J Wenum, area wildlife manager in Gunnison, explained that when landscapes are restored to a more natural condition, more uses can be accommodated. The testing of the oral vaccine will continue for a few more years, and biologists are cautiously optimistic that the vaccine will prove to be effective at limiting plague. “We won’t be able to prevent plague in every colony. But this work will help to stabilize the overall population at its current distribution and benefit this important species,” Tripp said. 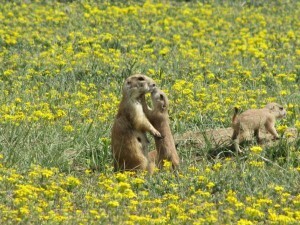 For more information about prairie dogs and other wildlife species, see cpw.state.co.us. 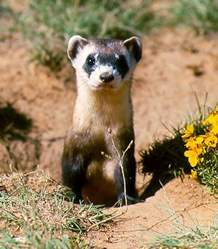 New Mexico has 150 known species of mammals, one of the highest numbers in the country. Eighty-two species of mammals are known to be hosts of fleas. We have 107 species of fleas in New Mexico. We have plenty of mammals and plenty of fleas. Several dogs in New Mexico have been diagnosed with plague. Plague is primarily a disease of wild animals, especially rodents. Some species are particularly susceptible. Prairie dogs, particularly the Gunnison’s prairie dog, are uniformly susceptible to fatal infections of the plague, and large proportions or even entire populations have been destroyed in a single plague event. Plague was first discovered in North America from California ground squirrels in 1905 and first detected in New Mexico rodents in 1938. As of 1982, 18 species of rodents, two species of rabbits and nine species of carnivores have been infected by plague in New Mexico. Plague is spread by fleas. The normal cycle of plague transmission is between wild rodents and their fleas in nature. When fleas ingest bacteria along with blood from infected rodents, the bacteria multiply rapidly in the gut of the flea. New Mexico has a high case rate of plague. For example, during 1988-2002, 112 human cases of plague were reported from 11 Western states. The majority, 97, of the cases were in Arizona, California, Colorado and New Mexico and 48 of those cases were from New Mexico.